February 11, 2018 at 12:09a.m. The time period after someone completes treatment for a substance-use disorder can be a difficult one. Often, they are unemployed and alienated from loved ones. Local community members are coming together to try to make the experience a little less stressful for those who are working on their recovery. Ohio Change Addiction Now (CAN) Mahoning County is collecting bags filled with personal-care items to distribute to local detox centers and sober-living facilities. Among those helping the effort are members of a grief support group for whom the challenges of recovery are all too familiar. 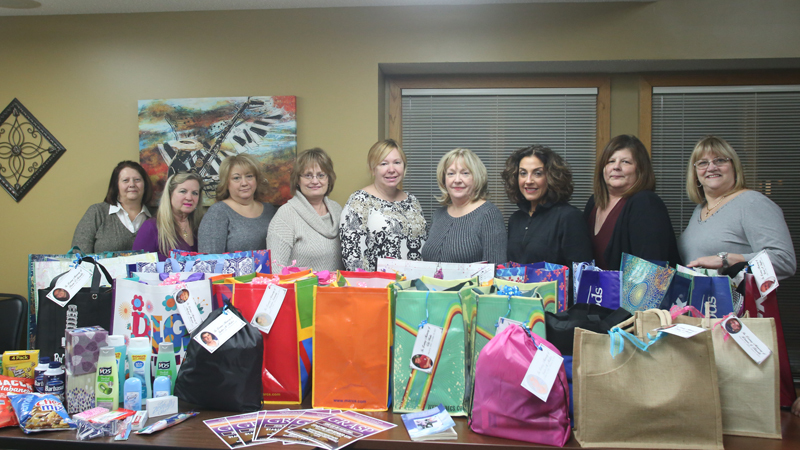 Members of the local Grief Recovery After a Substance Passing (GRASP) group put together bags in honor of the loved ones they lost to addiction. She was inspired by the memory of her son, Dennis, who died of an overdose in 2013. Each bag put together by GRASP members features a tag with a photo of one of their loved ones. The packages – dubbed “You Can 2” bags – are filled with items such as shampoo, soap, razors, notebooks and snacks. Inside every bag, too, is a note of encouragement from someone in recovery. Lovrinoff-Moran hopes to make it an ongoing project where Ohio CAN distributes bags year-round. She is hoping to get local businesses, civic organizations and churches in on the effort, too. If you are interested in helping, call Lovrinoff-Moran at 330-507-5313. To register for GRASP, contact Howells at 330-720-0878. The group meets every Tuesday in Suite B2 at 755 Boardman-Canfield Road. Jacky Thompson of Boardman learned about the project from a flier at a local business, and decided to involve her 10-year-old granddaughter, Cameran Mansfield, a fifth-grader at Summit Academy in Youngstown. Cameran has autism and Asperger syndrome, and her grandmother tries to keep her busy. This project was a way to do that, and also to honor Thompson’s brother, who struggled with addiction and died at age 44. “I said, ‘This is going to be something Cameran is going to do in memory of her uncle.’ We got lots of things,” Thompson said. In all, they collected enough items to fill 25 bags. Charlene Taylor, a member of GRASP, helped out in honor of her son, who died in 2016. “My son struggled for 10 years. He was in and out of rehab many, many times,” she said. Taylor said her son always tried to help others in need, and now she is doing the same. Although she knows as well as anyone the toll addiction takes on a family, she believes you can’t give up on anyone. Christine Allison helped out in memory of her daughter, who died in 2015. Allison’s daughter had two kids, one of whom Allison is now raising. She took her 9-year-old granddaughter shopping with her and used the project as a way to talk to her about avoiding drugs. Helping people in recovery helps with Allison’s own pain, too. September 1, 2018 12:07 a.m.